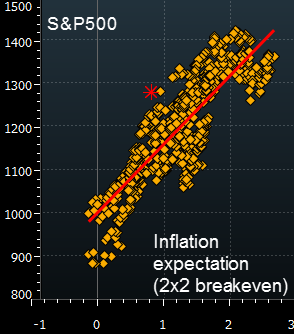 In recent years we've seen a clear indication that inflation expectations and US equity prices are correlated. Certainly once inflation reaches a certain level (by some estimates 4%), the relationship will break down and even reverse. However in the current environment deflationary risks drive this relationship. In other words we have an aggregate demand problem rather than any supply constraints. Expectations of price increases are a sign of a potentially stronger demand growth and higher margins, which is a positive for shares. The scatter plot below shows the relationship between the US equity prices and TIPS-implied (2x2 breakeven) inflation expectations over the past 3 years. The correlation has been surprisingly stable (around 0.86). The current level however seems somewhat out of place, at least based on recent history. It shows that either inflation expectations have declined too sharply (now at 0.82%) or US equities are still overpriced.